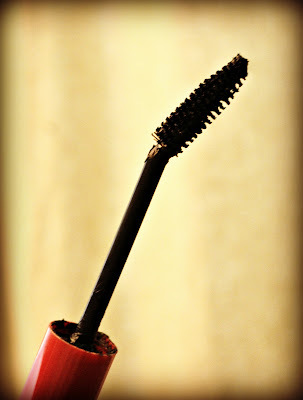 It has always bothered me that my mascara never looks like it does on TV commercials. I know that sounds silly, but it is totally true. Lash blast, great lash, lash out, straight wands, curved wands, cheap and expensive, I've tried them all, but nothing seems to create the dramatic lashes I been looking for. The other night I was having trouble sleeping (not because of my lack luster lases) and turned on a middle of the night infomercial. I have no idea what the heck they were advertising, but a very authoritative make-up artist told me that I could buy the cheapest mascara on the planet and still have great looking lashes. All you have to do is bend the tip of the mascara wand to a 45 degree angle. And it totally works! I am concerned I may be the only person on planet who didn't know about this simple little trick, but in the event someone out there is as clueless as I am, I thought I'd pass it along my new found wisdom!